It's actually quite refreshing to see a new theme come out that really does look quite different and it's not from one of the usual suspects. This month, Shape 5 have released Business Look, a native Joomla 1.5 theme that also comes with S5 No-MooMenu! The theme also comes with a quite nice Quick Contact module and an Image and Content Fader, which is quite a common module now, but nice to see it prepackaged. 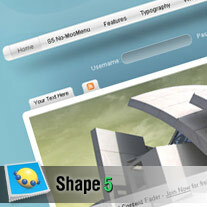 Click here to visit Shape 5. I will be for this theme.